ThaLoops are proud to present the new bundled hip hop samples pack. The bundle includes two best selling vinyl sound packs "Vinyl Shots 1" and "Vinyl Shots 2" at a discounted price. Vinyl Shots 1 & 2 Bundled. This new ThaLoops bundle includes 2 best selling vinyl sound sample packs for music production "Vinyl Shots 1" and "Vinyl Shots 2". That is over 465 true vinyl samples - ideal for hip hop, rnb, breakbeat beats. The themes are played by various LIVE instruments such as violin, cello, bass guitar, acoustic guitar, flute, trombone, saxophone and more. Chopped hip hop samples across the keyboard make fulfilling fresh ideas a simple and fun task. Adding analog, cracking, hissing, warm feel to your productions with vinyl shot hip hop samples is as easy as it gets. 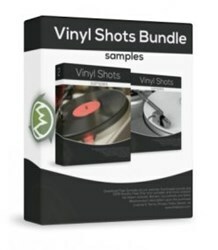 The "Vinyl Shots Bundle" pack download is offered at $22.04.